Bijou Lovely: go anywhere bag giveaway. 259 go anywhere bag giveaway. Update: This giveaway is now closed. Thank you all for entering! 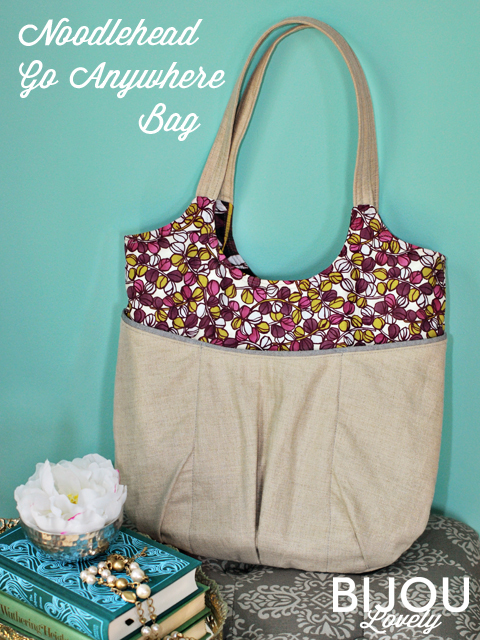 My review of the Noodlehead Go Anywhere Bag Pattern is up on Sew Sweetness today! Spoiler alert... I love the pattern! As I said yesterday I am really happy with my new bag. Anna and I have put together a little giveaway for you today so you can make your own! She's supplying the pattern, and I'm supplying the fabric! You've got 9 bundles to choose from. They're all bright and happy and perfect for a new summer bag for just for you! And you've got two chances to win! -Two yards of fabric (1 yard of linen and 1/2 yard each of two prints). The first winner will get their first bundle choice, and the second winner will get their choice as well as long as I have enough fabric (otherwise I will let you select another bundle). To enter, simply leave a comment on this post with the number of the bundle you'd like to win! As always, followers get an extra entry if you leave an additional comment. Please make sure to leave a way for me to contact you! If I can't find your email address, I'll choose another winner. I'll randomly choose two winners on Tuesday morning! Thank you Anna for creating and sharing such a wonderful pattern with us! :) Hope you all have a nice weekend! Congrats to our winners, Deserae and Jackie! I think I like 8 the best! 9 would be my second choice! I like #9 and #6. Hard to pick which one I like the most! I love number 7 :) And since I just bought this pattern, I'd probably make the 241 Tote with the fabric. Thanks to both of you for the giveaway! I think I like 3 the best! But they all are great! I like bundle 2 or 4! I can't decide! Your bag is fantastic! I really like number 7. Purple and green are my colors. Thanks! Oh definitely #7 for me! Exciting -- I'd love to make this bag! Oh, I love them all! I think I would choose #5 but would be happy with any of them! i found your blog today and i am now a happy follower! Ok I never enter giveaways but I really love bundles 7 and 8. Crossing my fingers! Adorable bag! Love bundles 8 & 2. alksadlier [at] gmail [dot] com. I like #1 (but they're all lovely)! Too many pretty combos but I think I like #1 the best! zoelizbeth (at) aol (dot) com. I sure am a follower. Love your work! Cool! #1 is my favorite. #7 looks great! Thanks for the chance to win. Ohhh...this is an awesome giveaway! LOVE your bag! I would pick...6 or 7. Love the purple linen, and like the pink dewberry & that green print too...lol..so I will just decide if I win, k? I love #7, but would totally sport a purse made of any of those combinations! Oh, I'd love to try this pattern!!!! My pick is #2 or #9! What a cute bag! Love bundle of fabric number 4. Thanks for a chance to win! I am a happy follower!!! I'd love to win bundle #2!! Cute Cute! I would love number 7! Thanks. I like #1! Purple and yellow has always been my favorite color combo. This bag is next on my bag "to do" list. Number 5 please - gorgeous colours! I love number 7! Beautiful colors. Thanks for the chance to win! Oh, I would like to win #9. I am a follower of your blog. I hope I win your lovely fabrics and the pattern! Number #9 is so cute but I like #6 too. Thanks for the chance! What a fantastic giveaway! Thank you so much! I really love bundle #1. Gorgeous! Number Seven! This is a fantastic giveaway, thank you so much for the inspiration, and the chance to win. Oh that's a tough choice but I think I'd go with #5. And I follow Bijou Lovely with google reader. And I follow Noodlehead too! Bundle 7 is the best love that look. There are so many to choose from, but I really like Number 9. I'm also a follower. Love your blog! Bundle Number 5! Ironically I cut out this bag yesterday, and have been stitching away at it today, so easy and a great pattern! Yours turned out so lovely! Number 6! Gorgeous fabric selections on each bundle - thanks! Bundle 1, the purple linen is awesome. I love the colors of the first bundle. They would make a beautiful bag. Thank you for such a generous giveaway! Great giveaway! It's so hard to choose - 7 and 1 are my favorite. I love bundle number 6. Such beautiful colors! I love #7! Thanks for the chance to win! I subscribe to your RSS feed! I hope that counts! Love the pattern, love bundle #7. Yay I am an rss follower of your lovely blog!! I love second chances (hahaha). Would love to win and would love budle 7 or 9 should I be lucky... fingers crossed! I love #9! (although there are several others I really like!) Great giveaway. I've made the 241 Tote so I know how amazing Noodlehead patterns are so I would love to win. Bundle 7 or 9 would suit me to a T!! Thanks for the chance. Number 7 is my fav. The pattern is beautiful. I'm not so much a pink person, so any of the non-pink bundles would be great. Thanks for the giveaway. I'm glad you enjoyed making the bag. Love this pattern. I choose bundle number 2. I am a follower, as well! Great fabric picks. I'd pick number 2! Nice giveaway! I like bundle #9! Thanks! I follow you. Thanks for the giveaway!! Sweet giveaway! I kind made fun of for wearing too much pink (hey, it goes with my colouring, so I'm going to say #9, the pinkest bundle. Yay pink! Yay giveaways! I like bundle #9. Super cute! I'm a follower too! Thanks for the giveaway. 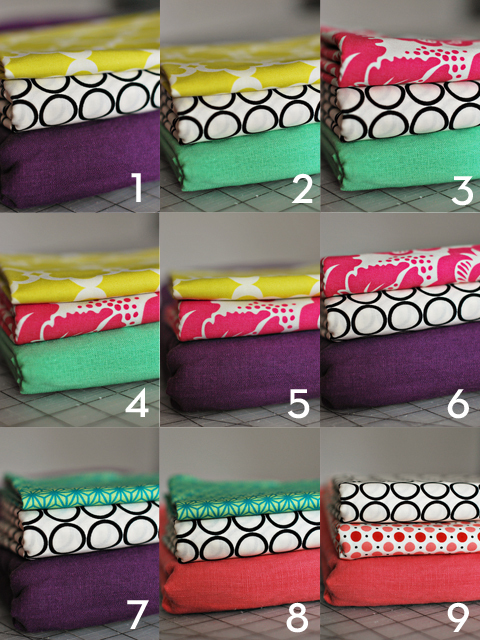 Bundle #9 is my favorite, I just can't get enough of those pink dots!! I think my fave is #6. Thanks for the giveaway. I have this pattern and have been wanting to try it but hesitant because I can't decide on a colour combo! stupid I know! I love #1 and #9--see I still can't choose! OHHHH! What a pretty bag! I LOVE all the fabric choices too!! I love #8!!! I follow on GFC and I also follow through my RSS feeder (Shrook)! I love bundle #1. :-) It looks like it's my alma mater's colors lol! Great giveaway! Oh this is my favorite bag!!! I choose #6. thanks for the giveaway. Just found your blog from Sew Sweetness and I'm loving looking at your projects! I am now a follower via email. i almost bought the pattern just this morning... now i'll just wait.. a little bit, anyway! i love bundle #9 and i love the shape of this bag!!! Cute fabric choices! #9 would be my choice if selected. Having fun on this Purse Palooza! I love #9 ans #1. My eye was drawn to number 7 first but they're all fabulous! Love this bag...I think it would be great for a small diaper bag. #7 would be the combo I'd choose. I like bundle 8 - coincidentally my favorite number!! #4=and this bag is on my summer list-so thanks for the inspiration! Hard choice, but I think I would go with Bundle #6. Thanks for the great giveaway! Wow-sweet giveaway! I love bundle #7! Great bag! Omg! I love 9. Very nice. I am loving bundle #2! How fun! It's a hard choice, but I think I'd choose #6! Thank you! Wow, I'd love to make one of Anna's bag and your fabrics are great!! I think #2 is my fav! Thanks for the chance to win!! Oooh, lovely giveaway. I like bundle #1. Thanks for the chance. I'm a follower too. Bundle #1 is my choice if I'm lucky enough to win. Wow, tough choice they all look great! I think I would go with #4 tough as my first choice. Eek! I've been thinking of this bag pattern for a while! Just finished my second 241 tote and love Anna's patterns! As for the fabric choices, so hard, but i'd say #8! and I am a follower since a couple of weeks. Tough choice. I think I like 5, 6 or 7 but probably 7 best. I LOVE bundle number 9! And I have been following your blog for a little bit now and think it is simply lovely. I'm loving number 1 and number 9. I've been meaning to try one of Anna's bag patterns and this could be my chance. Thanks! I'm also a happy follower! I can't decide between bundle #7 and bundle #8. I ♥ making bags. Love the bag pattern! I'd like bundle #9 if I'm the winner! I'm a new follower of your blog! Looking forward to fun reading!! I like bundle #9! I honestly love all the fabric combinations you've put together. If I had to choose, I think I like #8 the best. I love number 4! But they are all wonderful! I love bundle #1 Thanks for the chance to enter. I love no. 7. but all colors are great! Thanks for the give-away! I lik #1 and #8. Hard to pick one. Thanks for the chance! i like 5 or 6 - great fabrics! ooh! what a fantastic opportunity: I really like the bag that you made. thanks! so many good choices, but I think that I prefer #1. Love that pattern, and all of your fabric choices are lovely. I would choose 9 or 3. Thanks! i am a follower too! woo hoo!